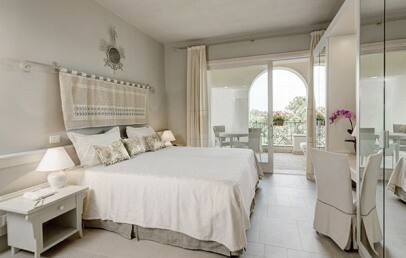 Castello is recommended for families with small children and for couples looking for a dynamic place for their holidays. Located in Santa Margherita di Pula, just 45 km from Cagliari and dipped into an enchanting garden of 47 hectares, the Forte Village Resort is the best solution for a luxury and comfortable holiday. The magnificent complex, in the middle of a wide bay on the Sardinian south-western coast, is composed by 8 hotels and elegant Suites: among these, the Hotel Castello is known for elegance and refinement, the perfect choice for those who want delicacy and quiet, just a few steps from the sea. The Hotel Castello is located close to the beach with a heated swimming pool with sea view and direct access to the beach. It offers different types of accommodations distributed on 5 floors, an Executive floor with dedicated reception, most rooms can accommodate a third bed and rooms with connecting door are available. On the ground floor is the garden Restaurant Cavalieri for dining "al fresco" with soft piano music during the evening. On the Executive floor are the Executive Deluxe Mare rooms, the Junior Suites and all Suites. 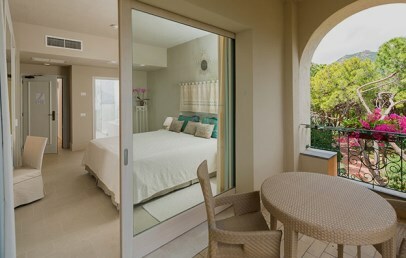 All with nice terrace and some with stunning view over the sea (see the Suites). 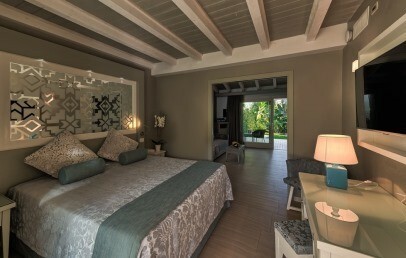 The family accommodations are at the 5 star Castello Garden Bungalow, an extension adjoining to the Hotel Castello. All rooms are modern and have a bath with tub and shower (some have also hydro-massage function), the Prestige and Prestige Plus rooms have also chromo-therapy function; air conditioning, minibar, LCD television, safety box. Some rooms can be interconnecting to another room. Special decor for children’s bedrooms on request and extra charge (Barbie™). Superior – double room with balcony on pine wood side, double bed or two single beds. Possibility of connecting rooms. Superior Garden – double room with balcony on the garden side, double bed or two single beds. Possibility of connecting rooms. Superior Mare – double room with balcony on the sea side, double bed or two single beds, bath with tub and shower. Executive Mare – spacious double room with sofa and balcony on the sea side and pool, double bed or two single beds. Possibility of connecting rooms. Executive Mare Plus – spacious double room with sofa bed and spacious balcony on the sea side and pool, double bed or two single beds. Possibility of connecting rooms. 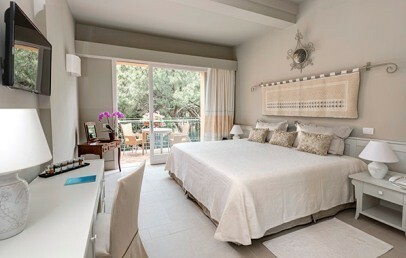 Executive Deluxe Mare – double room on the Executive Floor (4th floor) with living area and terrace on the sea side. De Luxe Room Patio – double room with double bed or two single beds, located on the ground floor with a patio. Ideal for 2 adults, 1 child and 1 infant. Prestige – spacious room with two Queen size bed, bath with tub and shower (some have a Jacuzzi or chromo-therapy), nice terrace on the sea side. Possibility of connecting rooms. Prestige Plus – with two Queen size bed, sleeping and living area (open space) and nice terrace overlooking the sea. Bath with Jacuzzi tub and some have also a chromo-therapy shower. Possibility of connecting rooms. Castello Deluxe Bungalow – large double bedroom with double bed or twin beds + sofa bed or in alternative a single bed for a child, bath with shower, some with a separate tub. Patio and garden area. 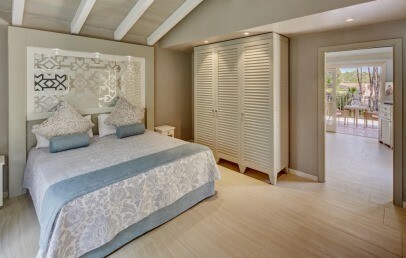 Castello Luxury Family Bungalow – two rooms separated by a sliding door. The master bedroom with bath with tub and shower and the living room with a sofa bed, convertible into two beds or, on request, it can be replaced by two single beds. Patio and garden area. Ideal for a family of 2 adults and 2 or 3 children under the age of 13 years. Castello Luxury Family Roof Bungalow – two rooms separated by a sliding door. Each room with a patio, a double bedroom and bath with tub and shower. The living room with sofa bed, convertible into two beds or, on request, it can be replaced by two single beds. These bungalows are located on the first floor with a large terrace. Ideal for families of 2 adults and 2 or 3 children under the age of 13 years. Castello Deluxe Family Bungalow – have a bedroom with bath with tub and shower, a living room with a sofa bed (2 beds for children) and a private patio on the ground floor. This bungalow is ideal for families with 2 adults and 2 children under the age of 13 years. Moreover the Hotel Castello offers the most beautiful Suites of the Resort, from the exclusiv Presidential Suite of 210 sqm + 150 sqm of terrace with small pool and fantastic view on the sea and surrounding to the other unique Suites such as the Imperial Suite, Royal Suite, Suite Charme, Suite Nora, Suite Bithia and the Junior Suites. For the health and the relax of its guests, the Forte Village Resort offers a fitness centre and spa, which houses the centre of Thalassotherapy, having an international reputation, with treatments based on marine elements (water, sand and algae), to restore the senses and the spirit. In the wonderful setting of a tropical garden, surrounded by a natural paradise, guests can give oneself up to the expert hands of professionals of the wellness, who will guide each guest along his personal regenerating route. For all guests staying at the Hotel Castello the Restaurant Cavalieri is the main one, located on the ground floor, offering a rich buffet for breakfast and dinner with also show cooking on the grill, piano music. Guests staying at the Hotel Castello Garden Bungalow are welcome at the Bellavista Restaurant for breakfast and dinner. Further restaurants open for dinner, not included in the half board, available with a supplement (table reservation required) are: Belvedere, Le Dune, Forte Gourmet, Terrazza San Domenico, Hell's Kitchen. 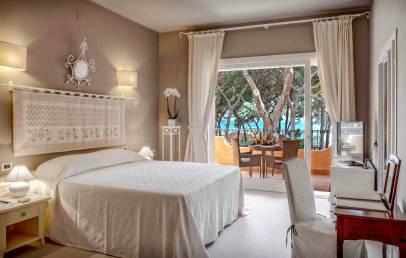 Guests staying in the rooms Deluxe Room Patio, Prestige, Prestige Plus and on the Executive Floors as well as in the Suites can choose additionally the restaurants Le Dune and the Belvedere (table reservation required, without supplement). In the nice lobby welcomes you the Bar Bandiere with inimitable cocktails. The Forte Village Resort offers its guests a wide selection of entertainment and leisure, which meets the needs of adults and children. Modern sports facilities offer several alternatives: football (3 five-a-side synthetic grass pitches and a regular sized grass pitch with a large stand), tennis (12 tennis courts with artificial lighting), gym, water sports, scuba diving and golf (18-hole golf club 8 km away "Is Molas Golf Club"), thanks to the constant and essential presence of qualified instructors. For people who need to relax, the swimming pools (six for adults and three for children) are available to the guests; people who want to go shopping, can visit Piazza Luisa and her Galleries (perfumes, jewellery, tobacconist, newsagent and several boutiques of the highest level), place of meeting, centre of the social life at Forte Village Resort. In the evening, the square becomes the protagonist, through the music and entertainment held within it, with top national and international artists. For those who prefer a softer atmosphere, Forte Village Resort offers The Mahiki Bar, where guests can enjoy the atmosphere of a tropical island. City tax – The municipality of Pula requires the payment of € 2,50 per person/overnight to be paid on spot. The tax applies from 01.04 to 31.10. Children under 12 years, disabled people and their assistants, business travellers and students are exempted. 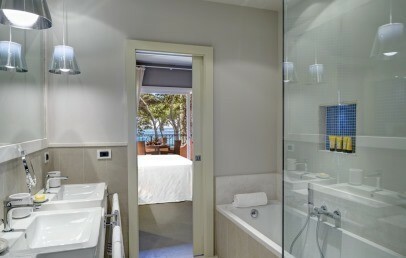 Modern double rooms with bathroom equipped with bath/shower, hair dryer. The rooms have a balcony overlooking the garden. These accommodations are ideal for couples or for a family with 2 rooms with connecting door. A baby cot can be added on request. Comfortable and modern double rooms with bathroom with tub/shower, hair dryer. On request it is possible to add a third bed or cot. The rooms have a balcony to the seaside. Guests must be aware that the floor space of the room will be reduced by adding an extra bed, therefore a written acceptance is requested. Modern rooms with the possibility to add a cot; some can be interconnecting by a door (on request). The bathroom is equipped with a tub/shower, hair dryer. The rooms have a balcony overlooking the pine grove. Spacious double room located on the 3rd floor. Some rooms can be interconnecting and a child bed or cot can be added (on request). The bathroom has a tub and shower, hair dryer and modern facilities. The Executive rooms have a balcony to the sea side. This type of Bungalow offers two rooms, separated by a sliding door. A double room with double bed, a bathroom with tub and shower and a living room with a sofa bed for two. On request this sofa bed can be replaced with two single beds. It is either located on the ground floor with a patio leading onto a garden or on the first floor with a terrace. These Bungalows are perfect for families with 2 or 3 children until the age of 13 years. Happy families at Forte Village Resort! EBON9 Special Early Booking - Book within April 30th 2019 and get a 10% reduction on your stay (not valid from July 27th to August 16th).